Saturday, January 26, 2019 – UW-M Panther Arena, Milwaukee, Wis. 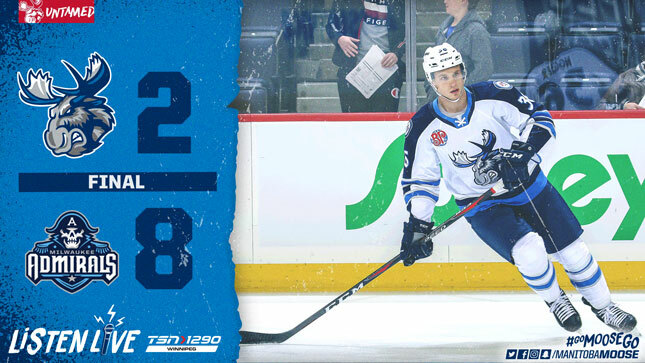 The Manitoba Moose (19-19-3-2) finished off their lead-up to the all-star break with a 8-2 defeat at the hands of the Milwaukee Admirals (22-17-6-1) at UW-M Panther Arena on Saturday afternoon. The home side used its power play to open the scoring 12 minutes into the contest. Cole Schneider slipped a pass cross-crease to Eeli Tolvanen who fired the puck to the back of the net. The Admirals had a good opportunity to add to the lead on a Joe Pendenza breakaway, but Ken Appleby shut down the chance, making one of his 12 saves in the period as the Moose went to the break down 1-0. Milwaukee built its advantage just 80 seconds into the second frame. Tyler Gaudet spied Tolvanen lurking on the far-side of the Moose net, hit him with a pass, and Tolvanen put away his second of the game. The Admirals added to the lead 3:15 later when Joe Pendenza tipped a point shot to the back of the net. The Moose got on the board midway through the frame courtesy of Chris Collins tipping a Cameron Schilling point shot past Tom McCollum for a power play tally to cut the deficit to 3-1. Milwaukee quickly went back on the attack as Emil Pettersson struck twice, once on the power play and once at even strength, to take a 5-1 lead to the third. After the Moose took an early penalty, Logan Shaw jumped onto a loose puck for a breakaway and buried a shorthanded tally 44 seconds into the period. The Admirals responded two minutes later as Jeremy Gregoire lugged the puck down the ice and slipped a shot to the back of the net. Tyler Gaudet made it 7-2 at 5:34 of the frame as he tracked down a bouncing puck in front of the Moose goal. Milwaukee tacked on another one with 9:33 to go in the game when Yakov Trenin redirected a point shot into the net. That tally rounded out the scoring as Milwaukee claimed the 8-2 victory. Seth Griffith has points in nine straight games with 13 points (1G, 12A) in that span. Logan Shaw scored his fifth goal in his last seven games. Chris Collins scored his first AHL power play goal. The Moose saw their point streak come to an end at nine games (6-0-1-2). Logan Shaw represents the Moose at the 2019 Lexus AHL All-Star Classic presented by MGM Springfield which gets going tomorrow with the AHL All-Star Skills Competition (6 p.m. CT), followed by the AHL All-Star Challenge on Monday (6 p.m. CT). 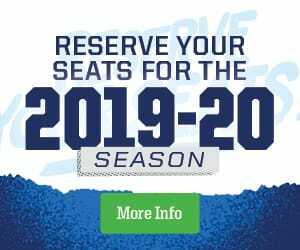 The broadcast is available on Sportsnet ONE/NOW or stream free with AHLTV.